Ken Woods. 11/08 Ron Farrugia, BSA. Photo Ken Woods. 11/08 George Stamatis 09/10. Hopefully more pictures of George's plants can be shown in a few months when fully open. In particular we will try to have more to say about their stigma colors to help solve some questions about T. imperialis in Australia. (see below). Tillandsia strobilantha Baker, Jour. Bot. London 26: 168. 1888; non Poiret, 1817. Type. Orizaba, Vera Cruz, Mexico, Bourgeau 2389 (K, GH photo), 1866. Tillandsia imperialis E. Morren ex Andre, Bromel. Andr. 100. 1889; nomen in synon. Basis horticultural. 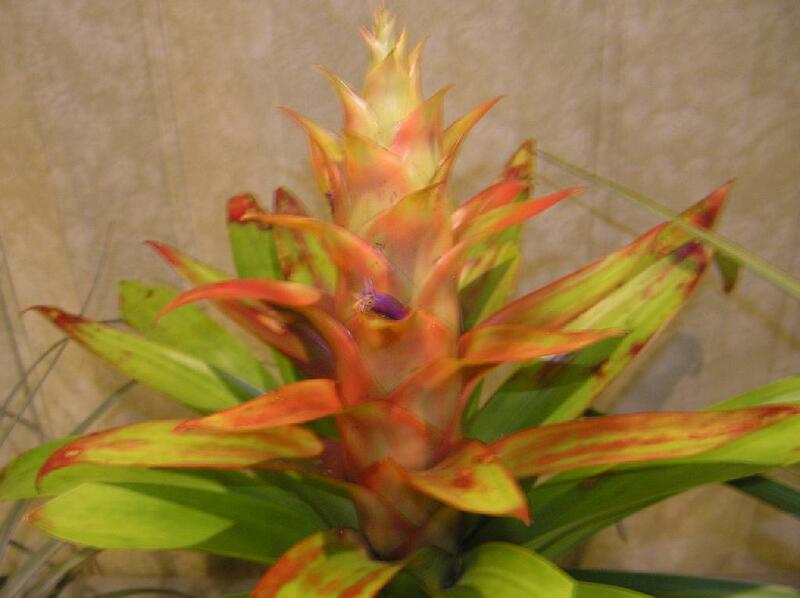 Guzmania imperialis hortus ex Andre, Bromel. Andr. 100: 1889; nomen in synon. Basis horticultural. Tillandsia imperialis E. Morren ex Baker, Handb. Bromel. 180. 1889; nomen in synon. Based on Morren Icon (K). Guzmania imperialis Roezl ex Baker, Handb. Bromel. 180. 1889; nomen in synon. Basis horticultural. Desc from Mez 1935. Note the description from McVaugh in Flora Novo Galiciana 1989 and in S&D page 908 includes that of T. candelifera which now stands alone. Tillandsia imperialis E. Morr. ex Mez, Pflanzenreich IV. 32, Heft 100: 482. 1935. Leaves few, to 40cm long, to 6cm wide next to sheath, then gradually tapering to an acute tip very often recurved, above sub glabrous, below grey appressed lepidote. Scape strong, erect, with very wide very dense sheaths, very narrow blades almost filiform, involute, much longer than the internodes. Spike well inserted very densely pinnate in the axis, up to 4 flowered, strongly complanate, sub-sessile, to 6cm long, almost 2.5cm wide,elliptic. Floral bracts densely imbricate, outside glabrous, carinate towards the tip, leathery, somewhat prominently veined, the uppermost tip somewhat incurved, to 3.5cm long, much exceeding the sepals. Petals longer than the sepals by 3.2cm, tubular erect. Type. Bourgeau 2389 (holotype K, GH photo), Orizaba, Vera Cruz, Mexico, 1866. DISTRIBUTION. Saxicolous on boulders and epiphytic in forest, 1300-2700 m alt, central Mexico. 97. T. STROBILANTHA Baker in Journ. Bot. 1888, 168. T. imperialis E. Morren (M.D.). Leaves about a dozen in a dense rosette, lanceolate-acuminate from an ovate base 2 in. broad, 1½ ft. long, an inch broad low down, mode¬rately firm in texture, subglabrous. Peduncle ½ ft. long; bract leaves crowded, with long erect free points. Inflorescence a dense oblong multifarious panicle 5-6 in. long; branch-bracts ovate, with reflexing tip bright red, much imbricated, the lower 3-4 in. long; spikes dense, few-flowered, distichous, quite hidden by the bracts; flower-bracts ovate, acute, 1½ in. long. Calyx 1½ in. long; sepals acute. Petal-blade small, violet. Hab. Mexico; province of Orizaba, Pavon ! Bourgeau 2389 ! Flowered at Liege by M. Jacob-Makoy, in March, 1879. This is the second of a series of articles on some of the interesting taxa of Bromeliaceae found in central Mexico. We hope to provide specific data and photos of the plants observed in habitat. In 1866, the French botanist E. Bourgeau was collecting plants in the vicinity of Orizaba in the State of Veracruz, eastern Mexico. His collection number, Bourgeau 2389 became the holotype of Tillandsia imperialis and is now deposited in the Kew Herbarium, London, England. Bourgeau was a naturalist stationed at Orizaba for a year during the French intervention in Mexico between 1864 and 1867 (known to the French as the Maxmillian of Hapsburg Empire ). Some Mexican plants, especially some found in the Orizaba region, were named after him including Tillandsia bourgaei, Agave bourgaei, Sedum bourgaei, Arenaria bourgaei, Vitis bourgeana and others. Tillandsia imperialis was first named by the Belgian botanist Edouard Morren and later validated by Benedict Roezl in 1881. The name Tillandsia strobilantha, described by Baker in 1888, should be regarded as a synonym since it was also based on the collection Bourgeau 2389 located in the Kew Herbarium (Smith & Downs, 1977). 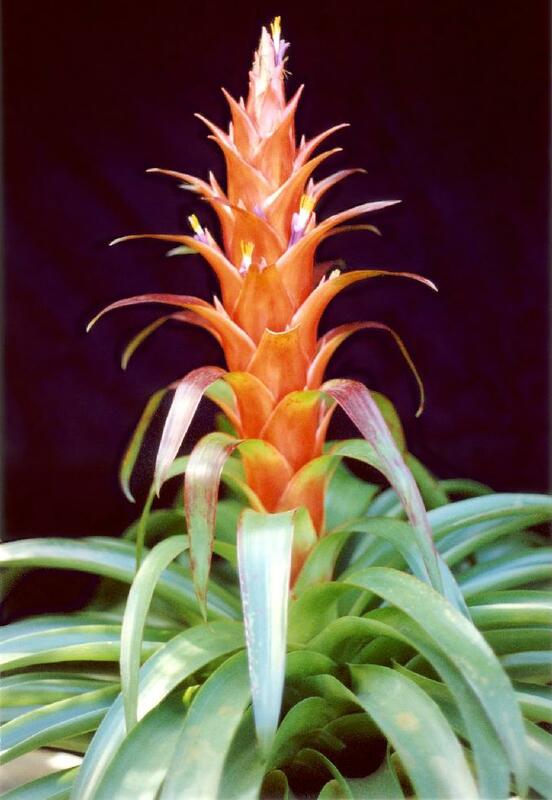 The specific epithet for T imperialis chosen by Morren is an appropriate one because of the regal appearance of this bromeliad. Orizaba is an industrial city located at the southeastern edge (on the leeward slopes) of Volcan Pico de Orizaba, that at 5700 masl (17,100 feet), is the highest point in Mexico. It is snow-capped the year round. At elevations between 1400-2700 m (4200-8100 feet), moist air coming from the Gulf of Mexico condenses and forms frequent fog that shrouds the woodlands in this belt. The cloud forest formed consists primarily of pine (Pinus patula) and oak (Quercus laurina). This is the home of Tillandsia imperialis. 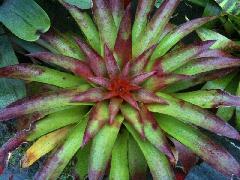 It is an epiphytic species found abundantly on the branches and boles of trees of the cloud forest. We have even seen it growing on lianas in nearby ravines. We have also seen and collected this plant at Cofre de Perote Volcano (west of Xalapa); Sierra de Chiconquicaco (north of Xalapa); both in the central part of Veracruz State, the easternmost section of the trans-Mexican belt; as well as at Sierra de Huayacocotla (part of the cretaceous limestone of the eastern Sierra Madre) in northern Veracruz. Its common name is "Suchil" an Aztec word meaning flower. The blue flowers appear from December to April (Chazaro, 1987 & 1988), protruding from between bright-red bracts on a stout, cylindrical inflorescence. We have collected it at Rincon Grande on January 22, 1983 and on December 29, 1989 (both in bloom); and on the trail from Ayahualuico, Veracruz to Patlanalan, Puebla, on April 9th, 1983, also in bloom. In November and December people from rural areas occasionally collect Tillandsia imperialis to be used to decorate Nativities as well as religious arches placed in front of churches and shrines. To quote Graf (1978): "Tillandsia imperialis; showy epiphyte at home at 5,000-8,000 feet altitude, and largely used by Mexicans at Christmas time to decorate for their Natividad, because of the festive spirit radiated by the flaming red central inflorescence, looking like a candle or slender cone; remaining in brilliant color through summer into winter; flower purple; the dense formal rosette of broad smooth leathery leaves a pleasing light green, about 1.5 ft. long." The range of distribution is from Smith and Downs (1977), McVaugh (1985), and Garcia-Franco (1987), however we disagree with them on some points. We disagree with the Garcia-Franco (1987) report from Nueva Leon since there is not a voucher specimen. We also question the Jalisco report given by Smith & Downs (1977) as well McVaugh (1989); east side at 6700 feet, Nevada de Colima volcano, 13 July, 1985, Goldsmith 26 (US). We believe there was either a misidentification or mixed label since it is very far west from the rest of its range in eastern Mexico. Furthermore, we and other modern collectors have visited this volcano several times and have never found it. We also question the accuracy of the Arsene 1922 (US) collection (cited by Smith & Downs 1977, not seen) reportedly to have come from Puebla, Puebla, because this town is so far inland (in a mountain rain shadow), and is too dry a habitat for Tillandsia imperialis, a plant that loves moisture. 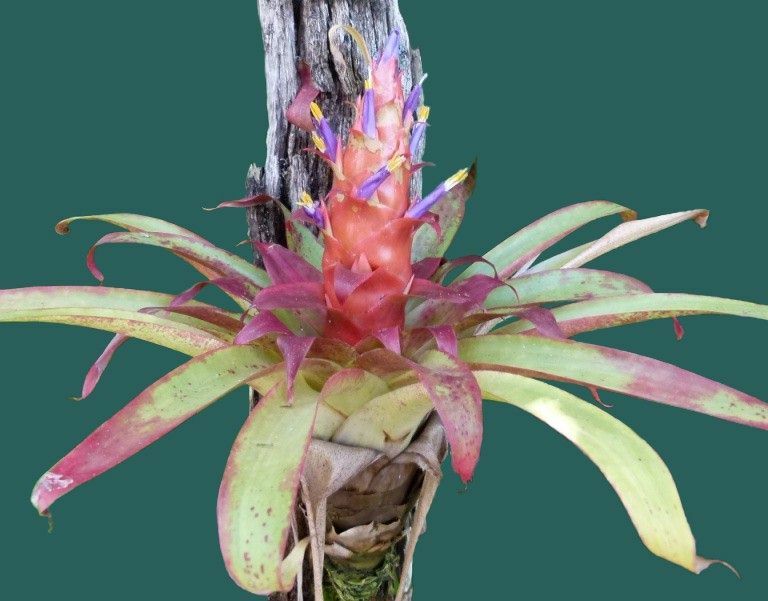 Perhaps Arsene used Puebla not as a specific locality but a huge region, since we are sure that Tillandsia imperialis could grow at Teziutlan and Zacapoaxtla, Puebla State, 60-80 km further east than Puebla City. Being in the eastern Sierra Madre its climate is appropriate. We would like to point out that all the exsiccata (herbarium specimens ) cited by Smith & Downs (1977) are fairly old (1950's and earlier). We wonder why this is. 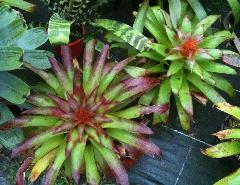 Tillandsia imperialis is certainly not a rare plant. It is fairly abundant locally. We presume there must be more recent specimens. This taxon was not included among the rare, threatened or endangered species of Mexican plants given by Vovides (1981); however SEDESOL (1994) considers it a threatened species. The right plant versus the left one: leaves are broader, bracts are more evenly and intensive red, corolla is darker and more stout, filaments and stigma are violet. Two different stigma colors (among other differences) I have found in T. fuchsia and its variety stephanii. Maybe in T. imperialis a hitherto overlooked undescribed variety exists. You should keep an eye on that matter. Still working on this species and trying to get it into my head what a T. imperialis should look like and the range of attributes it can have. The following is what Chris Larson wrote when I doubted his identification of the enclosed photo as T.imperialis x T. yunkeri and he said that was what Renate said in 1995 at the Adelaide conference. How good is your memory? Why do you think T. yunkeri? Nobody has checked to see if the sepals are free etc! 1. It never reaches the size that we've grown some of the other T.imperialis to. 2. The foliage blotches red more readily than what I call the normal clone. 3. The colour of the flower spike is not as orange as the normal clone tending more toward red. 4. The flower bracts are clearly more visible than the 'normal clone', or any other clone that I have seen photos of. The shape of the spike is distinct, also. When I took the plant & photos into the little side room to show Renate at that conference, she didn't hesitate when she stated the parentage as T.imperialis X T.yunkeri. The batch of plants came to Australia from Lau in about 1990. Amongst them were at least one with violet stigma lobes and one with yellow stigma lobes. Have you noticed this in your many T. imperialis? Walter Till has suggested it could be a new variety if there were other differences! I am sorry, I do not remember. But the slide shown here looks like a normal T. imperialis. There are types very big like from Buenos Aires Veracruz and there is a very small form from Oaxaca to Valle National that is only 20 - 30 cm high when flowering. I have a photo from a plant in Hases collection (there the plants become red leaves) that looks excactly like your photo. I will send it to you by mail. 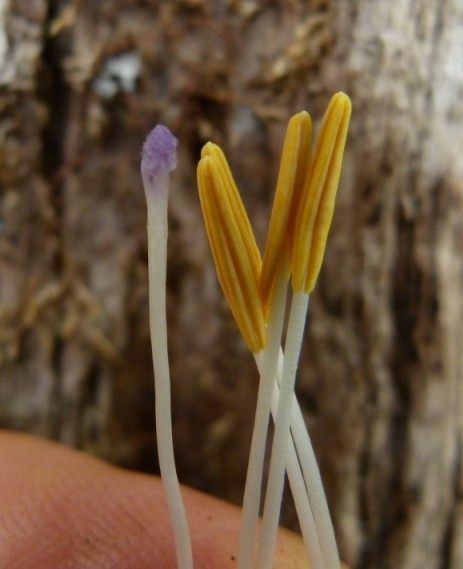 But there are also plants that look very similar: T. ponderosa from Chiapas. By the way I will describe a var. of T. ponderosa. There is the plant that looks very much like T. imperialis and the type from Guatemala with spreading yellow spikes like in the book of Isley. In Guatemala grow both types of plants. At one location I found them only 20 m apart growing side by side. I intend to work this out soon and I will send you material. Laurie Dorfer ... "I have just flowered this T. imperialis - mounted and grown hard. A spectacular species whether potted or mounted. High light brings out some great colour in the leaves, compared to the usual green leaves commonly seen when grown in the shade. However, the red gets a little washed out in the inflorescence. Stigma lobes purplish (violet). Although filaments had no violet pigmentation at all as Walter Till observed above."